The absolute worst thing to do when you visit Paris is plan too much. Eiffel tower, Notre Dame, L’Arc de Triomphe — stand in line for hours to experience what everybody says you have to. But you’d be committing a cardinal sin to visit Paris and not leave enough time to try authentic French cuisine. That’s why during my trip to Paris, I ventured into Le Marais; Paris’ epicenter of cool with hip boutiques, designer hotels, and art galleries galore. A neighborhood with narrow streets flanked by imposing façades and eccentric shops. A historical place that was completely untouched by the Haussmann renovation. 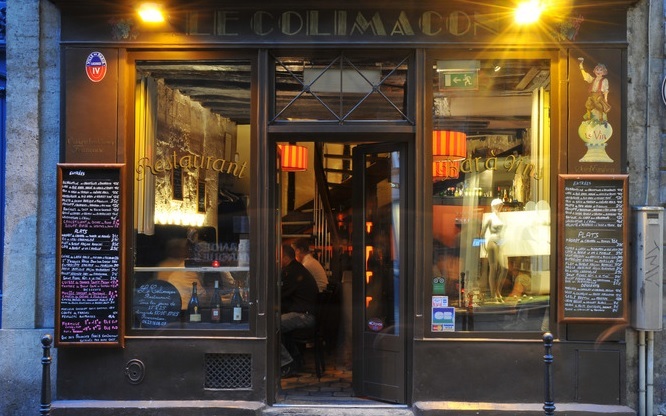 It’s in this aristocratic district of Paris that Le Colimaçon is located. Housed in a beautiful building from the eighteenth century. Inside, this ambivalence is reflected in the decor. Old stone walls, exposed beams and tiled floor make the room warm and rustic. The black velvet banquette chairs, small tables and a counter of the same color bring a touch of elegance and sobriety. At the back of the room is a stylized spiral staircase which fits in perfectly with the decor . One the ceiling there are large bright orange suspension and, on the walls, the yellow light fixtures gently illuminate the room. A room of modest size that complements a second floor of the same size. I was extremely pleased to find that Proprietor Didier Jourdan has managed to keep up a very important principle of French cuisine: fresh, local, and superior quality. It’s for this reason that the dishes here change with the seasons, but also some dishes that can be enjoyed all year round. 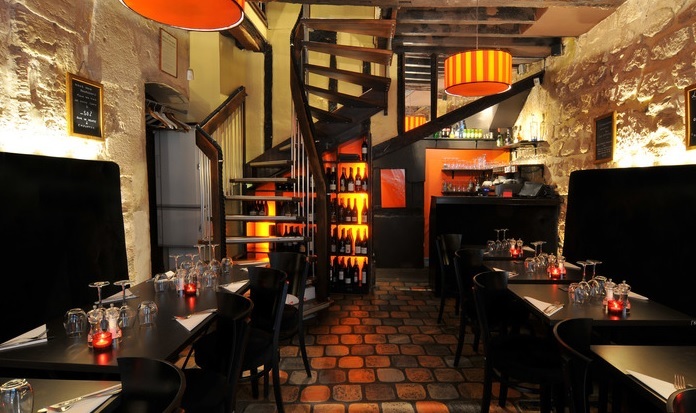 Upon arrival we are taken to the second floor and directly to the most intimate table in the house that over looks the peculiar and glamorous Rue Vieille du Temple. The in-house menu is craftily written on a chackboard. Croustilles d’escargots en persillade, hambourgeois de foie-gras et magret de camand fume, croustillant de chèvre à la tomate séchée, soupe de melon boule de miel, croustillant de brie de faux , lobe of foie gras mi-cuit with fleur de sel — these and many other exquisite entries between 8 and 16 euros. We decide to go with the Croustilles d’escargots and the Croustillant de Brie de faux (Brie deep-fried in phyllo dough) as appetizers. Service is on point as our serveuse gently delivers a selection of freshly baked bread, butter, and an olive oil vinaigrette. The six snails arrive from the kitchen door behind us. The entrance is triumphal and so is the plate. The shells are aligned on a bed of salad seasoned with balsamic vinegar. 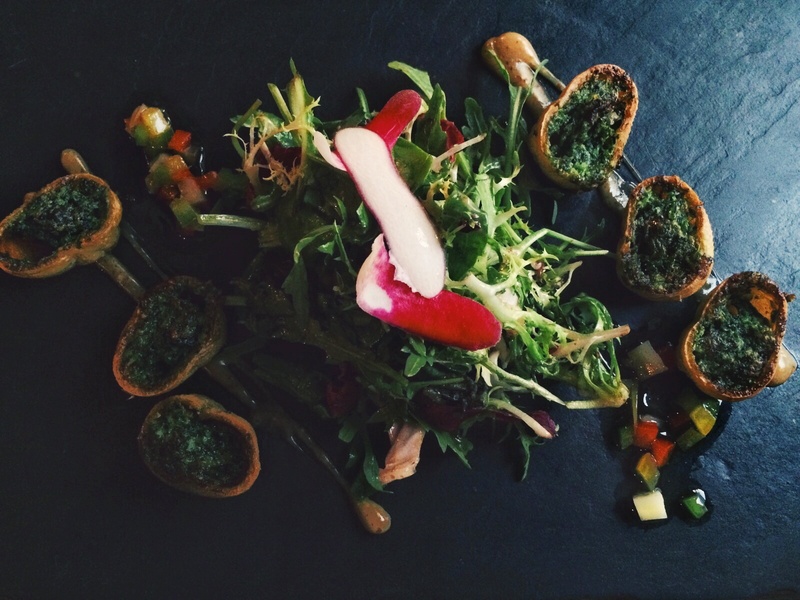 The snails are cooked in Burgundy and placed in the bottom of crusty rolls shaped shell. The snails are tender, almost melting. They contrast with the crunchy warm bread and fine cold salad leaves. The garlic, shallot and parsley are well perceptible on the tongue. A real treat! The second dish: the same finesse! Melty brie, crispy phyllo dough. The crunchy coating surrounding melted cheese is a magical combination and our only regret is not having another mouth-watering piece. We continue our adventure with our main dishes paired with a bottle of Bordeaux. We order the Côte de Boeuf de race and the Ris et Rognon de Veau caramelisé. 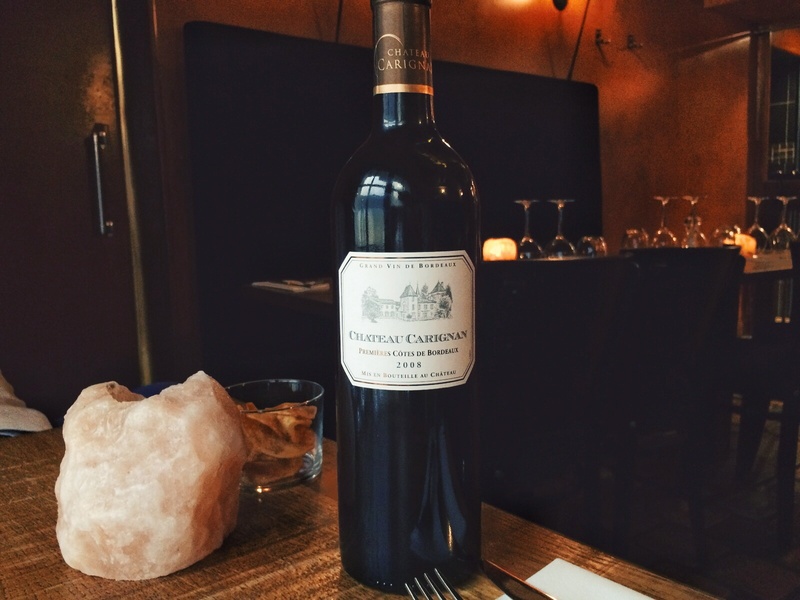 To go with our dishes we ordered a bottle of Chateau Carignan – Premieres Cotes de Bordeaux 2008. This wine has a very pleasant palate with silky tannins and the nose is toasty with caramel and very ripe red berry fruit aromas. 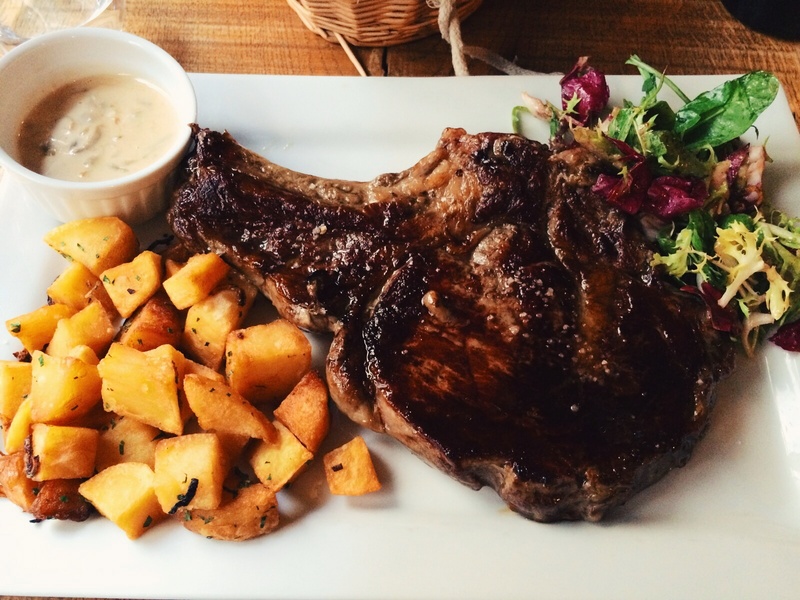 The rib steak was cooked perfectly and was full of flavor, moist, and melted in the mouth. 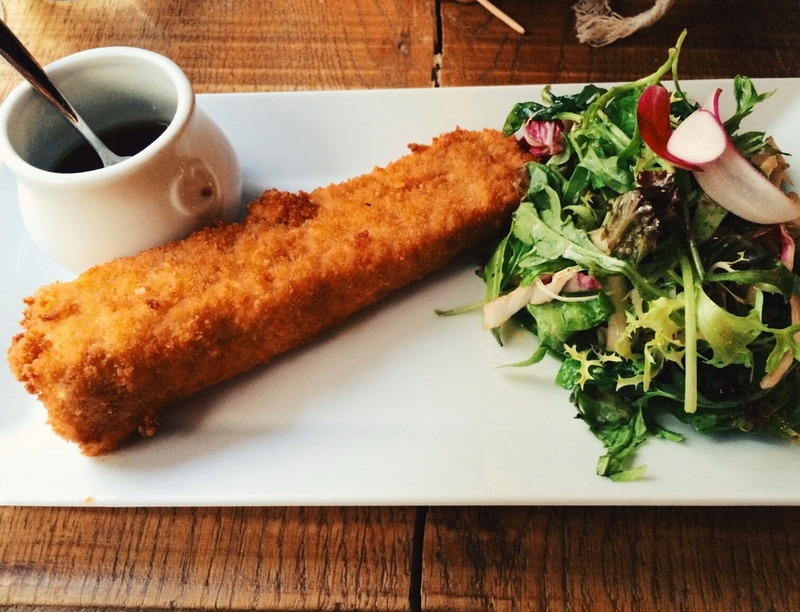 The highlight of this dish is, of course, its simplicity. The rub is light which lets you appreciate the flavour of the meat. Only the bones remain on the plate. Even after having finished the plate we did not feel heavy or bloated. The pommes frites were also are perfect. They were perfectly complimented with a mushroom sauce on the side. The frites and the sauce mingle with the meat in our mouths and surprise us by their flux. The caramelized Ris et Rognon de Veau (veal sweetbreads) was downright orgasmic. Extremely smooth, tender and moist, and the flavor was quite mild and creamy and played nicely with the rich and acidic sauce. A feast at Le Colimaçon costs around 40 € per person without wine. A price that is justified by all the same food quality and naturalness of the ingredients that are both healthy and authentic. If you decide to treat yourself to an amazing gastronomical experience At Le Colimaçon, you will discover the French classics of regional gastronomy as well as the different French wines. 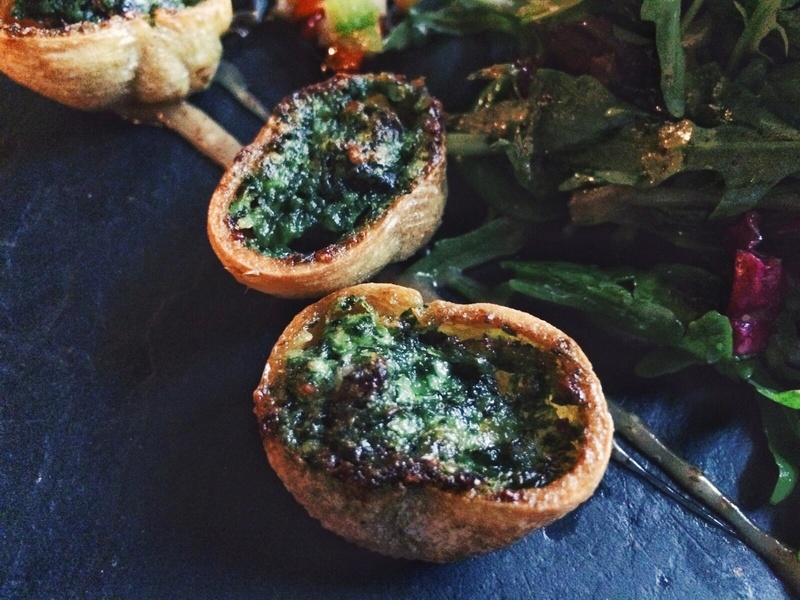 If you’ve never tried escargot, then this is the place to start — you’ll love them! 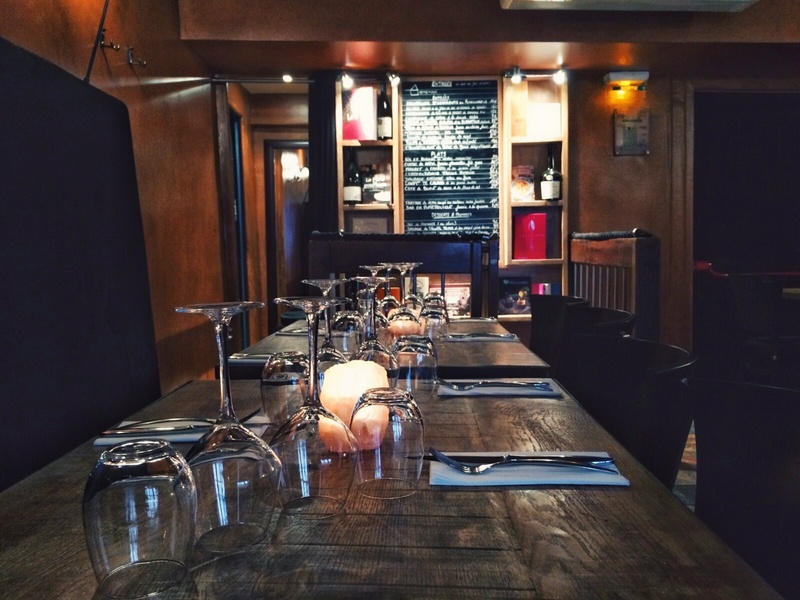 The entire team of Le Colimaçon will enchant you with their warm hospitality. 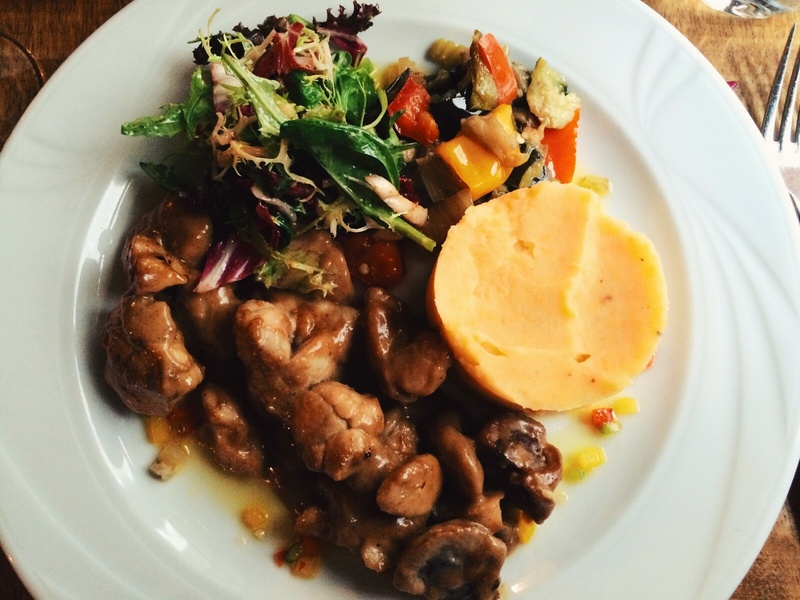 So forget “nouvelle cuisine” and enjoy the pleasure of French traditions!